At OnePageCRM, we believe in a simple but profound philosophy: The best CRM platform is the one your team wants to use. That’s why we created our CRM platform for salespeople with small and mid-sized companies, with their unique needs in mind, featuring a sleek, intuitive interface that even the busiest sales pro looks forward to using. Why? Because it makes their jobs easier. What’s standing in your sales team’s way? What’s stopping your sales team from achieving rockstar status? What’s keeping them from realizing their biggest ambitions, closing more sales, and boosting profits? If they’re like most sales professionals these days, those challenges they’re facing revolve around managing and nurturing their leads. Uncertainty about who the key purchasing influencers are or how to follow up with prospects. Prospects that are hard to reach or reluctant to respond. Overwhelm from a CRM system that’s clunky, overwrought, and hard to use. What would the right CRM platform for your team look like? We think about that question a lot here at OnePageCRM -- so much, in fact, that we’ve got some pretty specific answers. A truly exceptional CRM platform must possess an intuitive, streamlined UI for the best possible user experience. It should show you your sales pipeline at a glance, and it should be a breeze to manage your contacts along that pipeline. Also, it should be easy to get started. 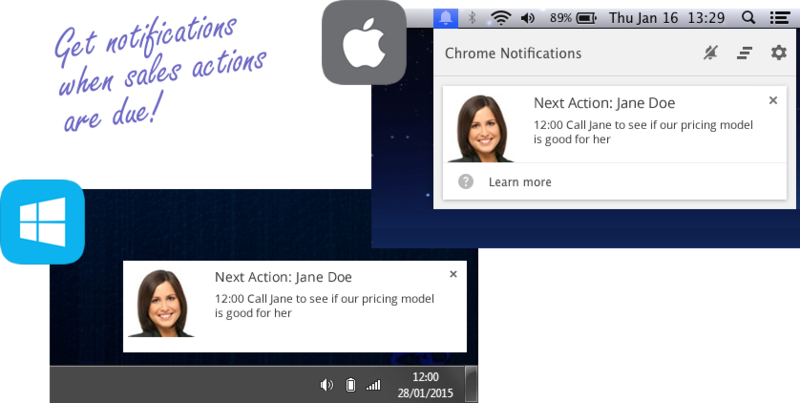 So many CRM apps make things unnecessarily complicated for the user. With OnePageCRM, you’ll be stunned at how simple and quick we’ve made the setup process. It’s easy to get started right away, on day one. The right CRM gives you the control over your sales pipeline, allowing you to customize and refine your sales process for different kinds of prospects and deals. That’s crucial, because not every client is the same, right? And finally, a truly exceptional CRM tool makes it simple for your team to capture leads, manage their relationships over time with those leads, and get the right “next-task” done at the right time. 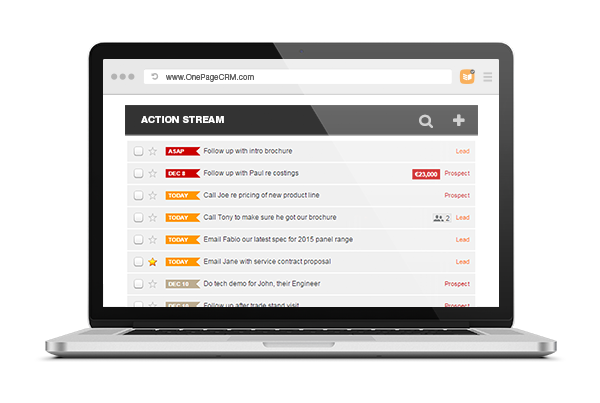 OnePageCRM helps your team stay on top of the sales process when they’re on the go with its mobile apps. Sales superstars know that in this dizzying digital age, it takes way more than the “7 points of contact” the old marketing maxim suggests if you want to convert more leads into satisfied customers who buy over and over again. It takes a diligent focus on cultivating that relationship, overcoming pushback in a reassuring way, and showing up every time, at the right time, with the right information. That’s exactly what we designed OnePageCRM to do. It’s the sales superstar’s secret weapon, for small businesses and mid-sized companies alike, and we’re confident you’ll agree that it’s the right CRM for you and your sales team, too. The OnePageCRM 21-day trial period is absolutely free, with no obligation and no credit card required. Try it out for yourself and see how its elegant, streamlined interface makes cultivating and managing your leads so much easier. 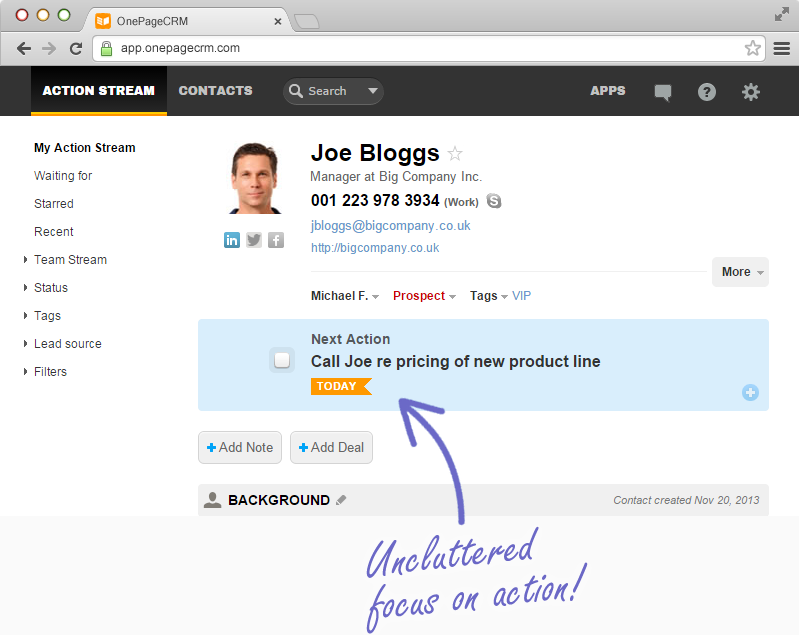 We think you’ll agree that OnePageCRM is simply the best CRM platform around.